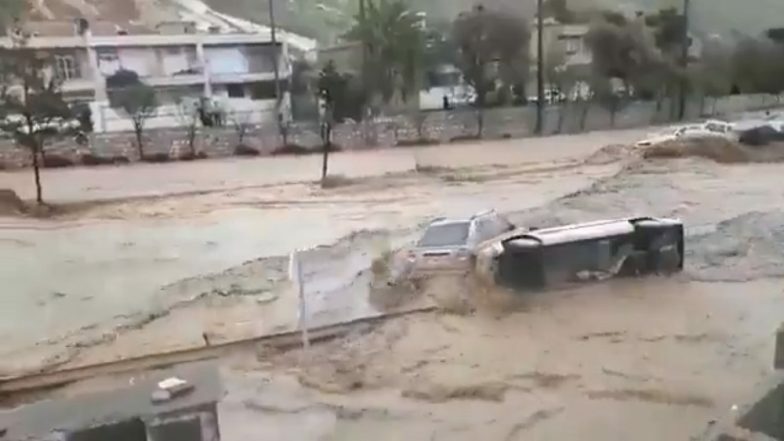 Tehran, March 26: The death toll from major floods swamping much of Iran has risen to 21, emergency services said Tuesday, as authorities sent safety warnings to mobile telephones across the country. Supreme leader Ayatollah Ali Khamenei issued a message of condolence urging officials to speed up relief efforts and compensation for victims of the floods, which the authorities described as unprecedented. The disaster, which the energy minister blamed on climate change, struck in the middle of Iranian New Year holidays, with many relief workers on vacation. Nineteen people were killed and 98 injured in the southern city of Shiraz, while one person died in the western province of Kermanshah and another in Lorestan, also in the west, rescue services said. Australia Floods 2019: Crocodiles and Snakes Enter Residential Areas in Queensland As Floodgates Opened. At least 110 people were reported wounded, according to the health ministry. With 20 of Iran's 31 provinces experiencing floods or facing an imminent threat, the country's National Crisis Management Committee was activated at the cabinet level. Iran's meteorological service has warned of more heavy showers until Wednesday, and flood warnings have gone out for central provinces such as Isfahan and the capital Tehran. Overnight the crisis management committee sent out multiple text messages to all mobile telephones in Iran urging people to be cautious and await instructions from official sources. "Remain calm when facing possible dangers... do not honk your car horns in mountainous regions as it might cause avalanches," one of the messages read. "Do not setup tents near rivers or mountainous areas... and most importantly do not cross bridges when floods are running underneath," read another one. The floods followed extreme rainfall which at times was equivalent to half of the average annual levels within 24 hours. It follows major floods on March 19 in the northeastern provinces of Golestan and Mazandaran, for which no official casualty toll has been given. Such a widespread flood threat is unprecedented in arid Iran, which until 2018 was dealing with decades of drought. "Climate change is forcing itself on our country," said Energy Minister Reza Ardekanian, who is in charge of dams and water supply. "These unprecedented floods in our country are because of climate change worldwide," he said on Monday, quoted by the Tasnim news agency.